Since I’ve been gathering some new readers lately who aren’t people who already know me, I thought I should write a post about myself. Maybe some of the people reading who have known me for awhile will even learn something new! – My name is Dara. It rhymes with Sarah. I’m from New Jersey so I say it with a short ‘a’ that can’t be explained in writing, but it’s the same ‘a’ you say in Dad or solidarity. – I was born and grew up in New Jersey. I do have a bit of an accent – my favorite word to say to show off the accent is “waterfalls.” I never knew I had an accent until hanging out with my cousins from Ohio. They said I said “dog” wrong! – I never in my life thought I would one day live in Kansas. When I was 16 I went to Israel for the first time and my mom joked about not coming back married. I joked back that I wasn’t going to marry anyone from somewhere like Kansas! Turns out there were 2 guys from Kansas on the trip. Turns out one of them has a sister who is now my good friend! Turns out I live in Kansas. – To be fair, I really live in a Kansas City suburb. When you think of Kansas you might think of tornadoes and Dorothy, but I live in a city much bigger than the tiny town I lived in before we moved here! We have just about everything here. But we really need an Ikea. 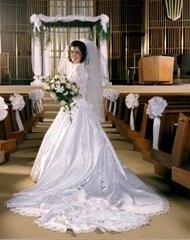 – I met my husband Dave when I was 18, just after our first semester in college. 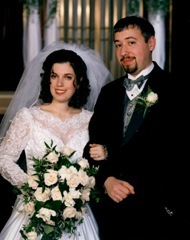 We got married 4 years after we met, on December 26, 2000. At that time I was in grad school getting my degree in social work. 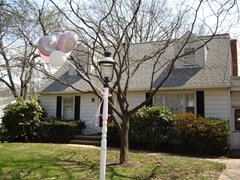 – We bought our first house in May of 2003. 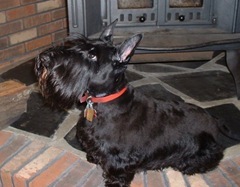 We got our Scottish Terrier Rudy in November of 2003. 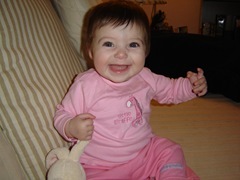 We had our first child in April of 2005 – a girl! – Our next baby was born in June of 2007 – a boy! 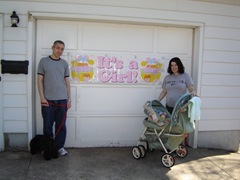 We moved to Kansas in November of 2009. 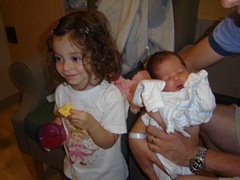 In August of 2010 we had our third child – another boy! – I started this blog after we moved to Kansas. The name is a play on Dorothy’s famous line “Toto, I’ve a feeling we’re not in Kansas anymore.” I used the blog to show off my kids’ school projects and some of our family adventures. 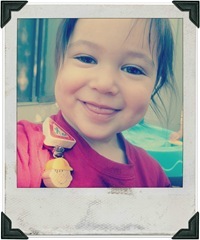 I am now using it as a mixture of a family blog and a crafty home blog. – I’ve always been into crafts. For awhile I was very into scrapbooking. I then got very into knitting. I still knit a lot and post about my knitting projects occasionally. I am just getting into home decor type projects and post about those when I do them. I am also recently into thrift and vintage shopping, though I’ve always been into buying my kids’ clothes used for cheap! – Our family is Jewish. I sometimes post about Jewish holidays and traditions. – We travel relatively often. 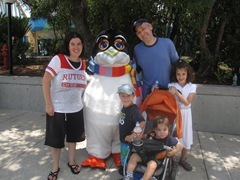 Some of our recent family trips have taken us to Israel, Disney World, Omaha, San Antonio, and of course to New Jersey to visit our families. – I am newly a “runner,” really a jogger. I am currently training for the Wine & Dine Half Marathon taking place in Disney World the night of November 10 – my birthday! – I love meeting people and getting comments on my blog posts! If you look at the comment form, you will see a drop box where you can log into google or other accounts to leave a comment, or you can choose name/url. You don’t have to comment anonymously! – Some things I love include reading, knitting, hanging out with my friends, having great ideas for my home, all things Disney, coffee, hamburgers, animals, shopping, doing things with my kids, getting a break from my kids, etc! 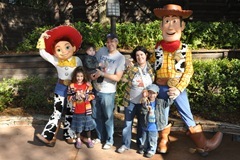 Now let me introduce the stars of my blog, my kids! 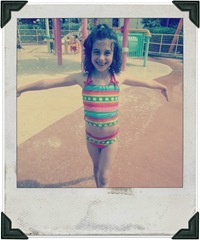 Gabriella, mostly called Gabbie, is a 7 year old dancing girly girl. People say she looks just like me, but I think she is much more girly! She is very into American Girl. She is beginning to feel too old for Disney princesses, but she still loves them too. She just learned to swim underwater. She loves to wear skirts and dresses and to put fancy ribbons in her hair. She loves getting her hair and nails done! Her favorite movie right now is McKenna Shoots for the Stars, from American Girl. She enjoys playing a made up game where she is the mommy and she has 5 kids. She also loves to read! When she grows up she wants to be an art teacher or a dance teacher! She can be shy, but makes friends easily. Zachary is 5 years old. He is very funny and speaks very earnestly. He loves playing with his friends but still has trouble sharing. He is the pickiest eater and would eat only pizza, chicken nuggets, hot dogs, and fish sticks if he had the choice. His favorite things are trains and he is obsessed with the train at the zoo. He also enjoys biking, although he is afraid to take off his training wheels. When he grows up he would like to be a train conductor but I think he might become a rabbi. 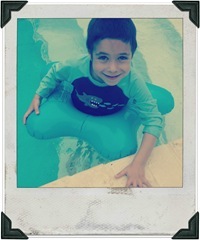 He is very outgoing and fun to be around! Simon is just about 2 years old. He loves to do whatever his sister and brother do. He talks way more than either of them did at his age! He loves to sing. He loves trucks, especially firetrucks, and he loves trains and airplanes. He likes to look at books and he loves Mickey Mouse and Donald Duck. He likes to talk on Skype / Facetime. He is obsessed with shoes. He loves animals, especially dogs, elephants, and monkeys. He is such a sweet little boy! I hope you have enjoyed getting to know us better. Please feel free to ask any questions!